The Indians in New Mexico may be divided into two general types — wandering and pueblo. The Athapascan, or wandering Indians, constitute a group which has drifted from the far north into New Mexico, They are more or less nomadic and war-like, and not agriculturally inclined, therefore to a large extent dependent upon their neighbors. 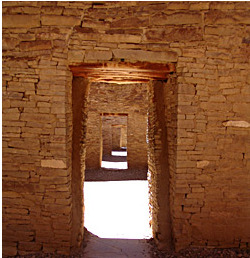 The remaining Indians in New Mexico are the pueblos. These groups are independent, peaceful, and industrious, particularly along their respective lines of weaving, basketry, pottery, and agriculture.